RIO DE JANEIRO, BRAZIL – Actress, producer and diver Sofie Mentens has spent the last two years exploring the underwater worlds off the coasts of Brazil and the Caribbean as a co-host of the Brazilian channel, Canal Off’s diving show, “Submerso”. Sofie Mentens co-hosts the Brazilian diving show, “Submerso,” photo courtesy Sofie Mentens. Born to a Belgian journalist father and a Brazilian mother in Antwerp, Belgium and raised in Amsterdam, Holland the now 26-year-old Mentens always loved acting, sport, water and Rio. “My mother is from Brazil, so I always had connections to Brazil,” said Mentens who spoke with The Rio Times while preparing to travel to Africa for the taping of the fourth season of “Submerso”. In 2011, after finishing university, where she studied Media and Entertainment Management, Mentens followed her dream. Struggling at first to find employment in Rio, Mentens, who also studied acting at UCLA in Los Angeles, California for one year after leaving high school and later worked in Amsterdam as an actress in the country’s most popular soap opera “Goede Tijden, Slechte Tijden” (“Good Times, Bad Times”), received an invite from a Rio friend and television host to attend a network meeting. 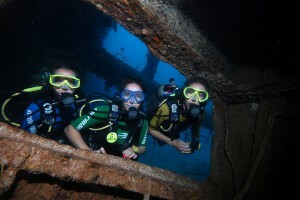 Hosts Sofia Graça Aranha, Sofie Mentens and Marcela Witt in the waters of the Caribbean during the third season of Submerso, photo courtesy of Canal OFF. During the first season of “Submerso,” Mentens and co-host Marcela Witt explored the waters off the coast of Brazil from Rio to Recife. Mentens had learned diving with her father as the two began taking lessons together in Spain when Mentens was eleven. “I was always very connected with water. I did seven years of synchronized swimming. I competed. I trained five times a week,” said Mentens who has also practiced Thai boxing, yoga, windsurfing, skydiving and is currently learning to surf from her boyfriend, professional surfer Marcelo Trekinho. During the second season, the three hosts traveled to Angra dos Reis, Bonito, and Santos in São Paulo and in the third season they filmed in the Caribbean where Mentens also did the production for the filming in two of the three islands they visited.